Students will be able to recognize a quarter, know its value, and add quarters together to find the total amount of money. Call the students together as a group. Ask the students to name the different values of coins. Reinforce that coins include pennies, nickels, dimes, and quarters. Inform the students that today they are going identify and count quarters. Ask students if they know the value of a quarter. Reiterate that the quarter is worth 25 cents. Inform your students that a quarter is equal to 25 pennies, 5 nickels, or 2 dimes and 1 nickel. Show this with the pretend money. Inform your students that it is easier to carry 25 cents as a quarter than 25 pennies. Show students the visual of one quarter versus 25 pennies. Explain that both values are equal. Ask students to identify the value of two quarters. On the whiteboard, add 25 cents + 25 cents in a vertical equation. Solve the addition equation with the class. Inform the students that 50 cents is equal to 50 pennies, 5 dimes, or 10 nickels. Ask the students the value of three quarters. Place students in pairs to work. Give each pair three small cups with varying amounts of quarters in them, up to five. Ask the students to complete three separate equations by adding the quarters in each cup. For example, cup 1's equation could be 25 cents + 25 cents= 50 cents. Cup 2's equation could be 25 cents + 25 cents + 25 cents = 75 cents, and cup 3's equation could be 25 cents + 25 cents + 25 cents + 25 cents = 100 cents. Tell the students that 100 cents is equal to one dollar. Walk around the room, and monitor the pairs of students. Select one or two pairs to come to the whiteboard and demonstrate how they came to their answers. 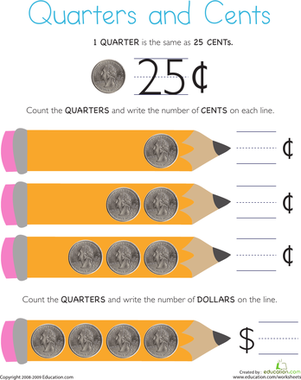 Give each student the Quarters and Cents worksheet. Enrichment: Give the students more than 5 quarters in their cups to add. Support: Give the students fewer than three quarters in their cups to add. Provide pennies to help them count. These can be used as manipulatives. Grade the worksheet completed during independent work time. Give feedback, and allow for reinforcement if the students did not master the concept. Ask students the value of a quarter. Ask how many quarters make 50 cents. Ask how many quarters make 75 cents and 100 cents. Show the students a penny, a nickel, a dime, and a quarter. Ask them to identify which one is a quarter. Counting quarters is simple once you learn how. 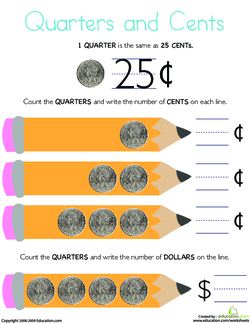 Practice counting quarters with your child using this math worksheet. 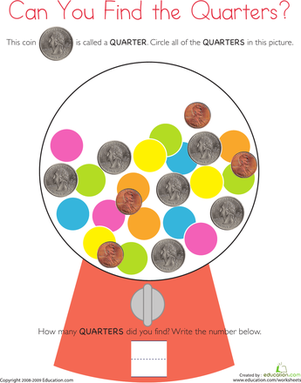 With this first grade math worksheet, kids learn the name and appearance of quarters, find and identify quarters, and distinguish quarters from other coins. 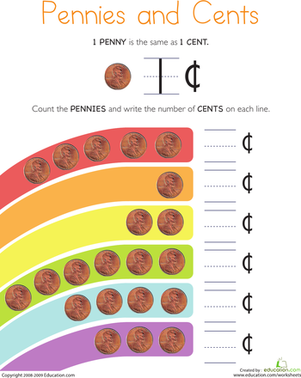 Practice your cents sense counting pennies with this worksheet! Add up the coins to see how much change Chris and Yannick have! 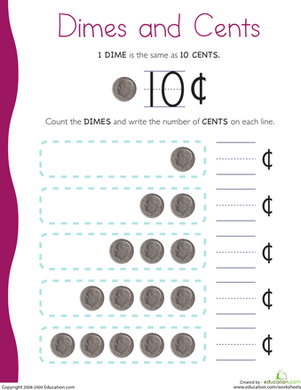 This worksheet, featuring nickels, dimes, quarters, pennies and a half dollar, will help your early learner with his money counting skills. Checking out this cute worksheet just makes cents. 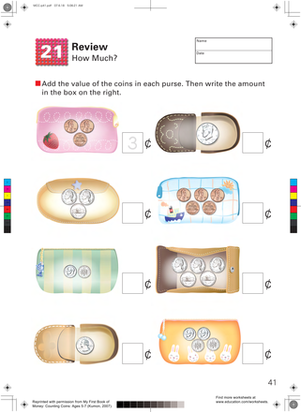 With this worksheet, your child will sort different coins and decide how many cents each one represents.